I guess I’m still old fashioned. I still call those things in front of the pilot “instruments,” although the preferred term for a panelful of them shifted to “avionics.” At least most people and I have stopped using “gauges.” Choose the term that works for you, but mail order giant Aircraft Spruce just sent offerings to builders, whether at home or in a factory. “Spruce,” as many abbreviate the Southern California-based company, serves a broad range of aircraft markets. For big or small aircraft, people seem to like Belite Electronics (sibling to Belite Aircraft most recently of Skydock fame). A former tech entrepreneur, James Wiebe designs airplanes certainly appears at home with electronics. He’s developed a wide range of very light, very low energy use, very accurate instruments. “Come to Aircraft Spruce for your favorite Belite products,” said Aircraft Spruce reps. Visit the company’s web page for Belite Radiant instruments. The new instruments combine many functions into simple and small, lightweight units. “Belite has created these new units with one specific feature in mind: persistence,” noted Spruce. Radiant Instrument will graphically display the last 30 minutes of fuel level information along with current fuel level, providing pilots with the ability to look at information on displays screens, to ensure a safer flight. Belite’s Radiant Instruments are designed for a standard 2.25-inch cutout, using up to 100 milliamps of power from a supply of 8 to 14 volts. All instruments are dimmable, Spruce clarified. Belite’s instruments will be of interest to kit builders, ultralight fans, and to manufacturers of Light-Sport Aircraft. Those from Sandia Aerospace are better suited to LSA and larger aircraft. This Albuquerque, New Mexico company earned attention when they offered their drop-in EFIS at AirVenture by giving away a free aerobatic flight with purchase of the new digital instrument. It can fill a space in a panel as a back-up instrument. 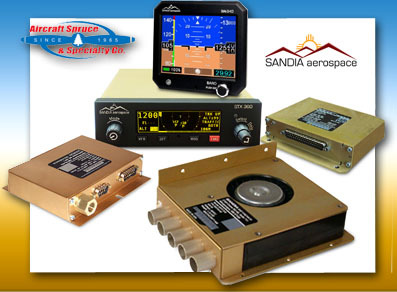 A range of Sandia products are available from Aircraft Spruce. Sandia Aerospace produces high quality transponders, altitude encoders, airdata computers, avionics cooling fans, and Marc 70 interface modules. “We offer wire harnessing and custom coaxial assemblies to make shopping for a Sandia Aerospace transponder all one convenient shopping experience for your aircraft needs, said Aircraft Spruce. 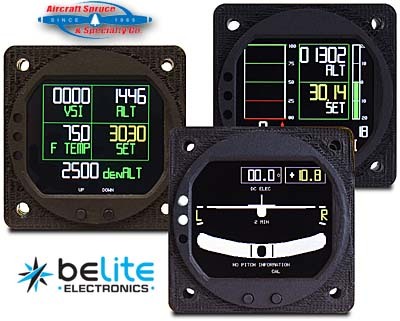 For more information on Belite or Sandia avionics offerings, please contact Aircraft Spruce at 877-477-7823 or 951-372-9555. Aircraft Spruce’s complete product line is available online at www.aircraftspruce.com. Request a free copy of the company’s mammoth 1,100-page catalog. The catalog is available in print, on a CD, or in PDF format. If wiring up the panel in your light kit aircraft or ultralight, Aircraft Spruce is again at the ready to assist you. In fact, they’ll do all the hard work, which can hasten you to flight. Check out this video with Ryan Deck.